A taste of the past will be on the menu at the famed James Beard House in January when guests sit down to a classic French dinner. But it's a taste of the future that the man behind the meal hopes they take away. Brandon Chrostowski is orchestrating the dinner with a team from his French restaurant EDWINS in Cleveland — a team made up of formerly incarcerated men and women. See it's not just the music that's different at this white tablecloth restaurant complete with cheese cart and $33 table-side burger service (the Motown soundtrack at dinner is just good for you, he says, though it's also a nod to his Detroit upbringing). 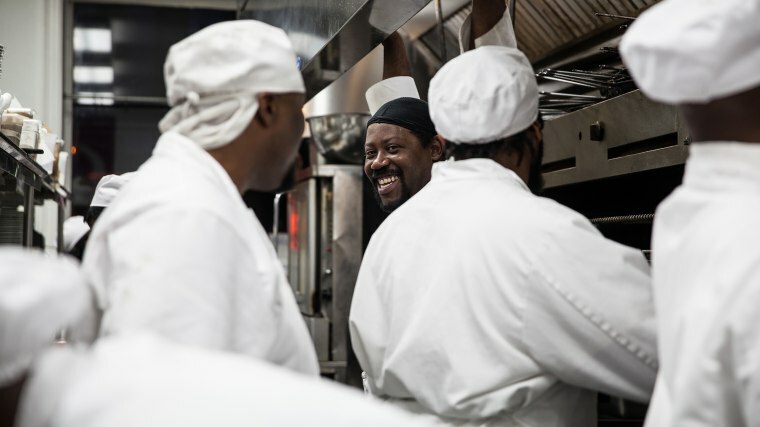 The restaurant is also part of an intensive culinary training program that equips people released from prison for a new future — as long as they're willing to work for it. Not everyone makes it, at least not on their first go-round. “The first two weeks are pretty intentional; they're pretty hard,” says Chrostowski. Half the class won't make it through the initial few weeks while another 10 to 20 percent won't complete the full six-month course. And that next step is anywhere but back behind bars; among the graduates since EDWINS opened in November 2014 “one percent return to prison,” Chrostowski says. “That number is unbelievable. Literally, people won't believe you.” For comparison, more than four in ten offenders nationwide return to state prison within three years of their release, according to a 2011 PEW report. Now that unbelievable success is being showcased with one of the highest honors in the industry, Chrostowski says. For the several students (that he's identified but not told yet) and one graduate going to New York, “it's like winning the high school championship,” he says. They'll be able to say, “'we were the team that took Cleveland to the James Beard House,'” he goes on, “'we were the people who represented the 52,000 people behind bars in Ohio.' There is pride and there is responsibility,” with that. Chrostowski himself got that opportunity as a youth in trouble when a Detroit judge offered him probation instead of prison if he got a job. Chrostowski landed in a high end restaurant when a chef gave him a chance. That opportunity launched his culinary career that has spanned top restaurants in Chicago, New York, and Paris — and the seed for EDWINS was planted. Now the hope and mission of EDWINS is spreading, inside and outside prison walls in Ohio, with culinary clubs where currently incarcerated people are empowered to teach classes, and with the 200-plus graduates outside who are teaching and learning and growing, Chrostowski says. And it's spreading beyond Ohio with a new film from Tom Lennon. What could things look like if we just gave someone an opportunity without question? Knife Skills, which follows the inaugural class and opening of EDWINS, just landed on the short list of contenders in the documentary short subject category for the 90th Academy Awards.